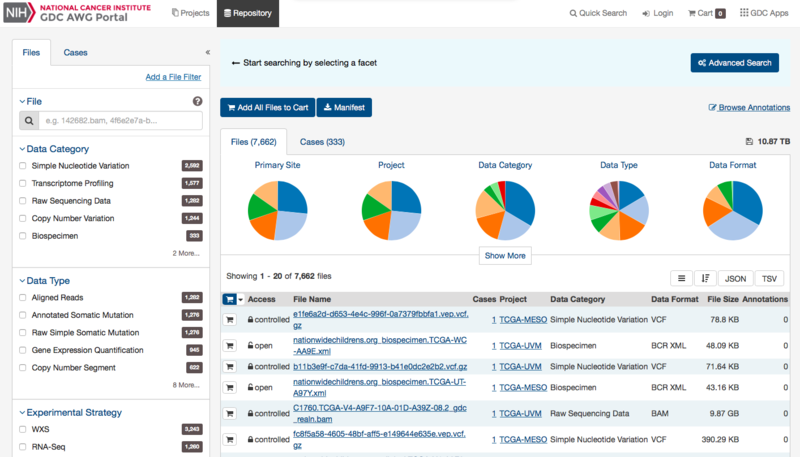 The GDC Pre-Release Data Portal provides users with web-based access to pre-released data from cancer genomics studies that have been harmonized by the GDC, but not yet released in the main GDC Data Portal. Pre-Release Data Portal will appear similar to the GDC Active Portal, but the Pre-Release Data Portal features are a subset of what can be found in the GDC Data Portal. For more information on any of these general features please review the GDC Data Portal User Guide. The GDC Pre-Release Data Portal provides access to datasets prior to release to a group of users specified by the data submitter. This area is only available to data submitters (or their designees) for reviewing pre-release data. Users must be granted access as specified in the GDC Pre-Release Data Admin Portal section and have downloader access within dbGaP for the specified project. To learn more about obtaining the required credentials and authorization, see Obtaining Access to Submit Data. 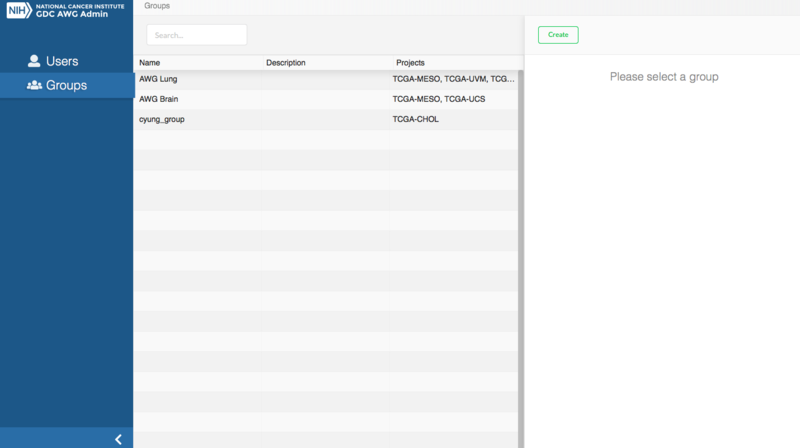 The tokens used to download files from the GDC Data Portal and Pre-Release Data Portal are related but distinct. Specifically, the token generated in the Pre-Release Data Portal contains a longer version of the regular GDC Authentication Token downloaded from the GDC Data Portal. Because of this, the GDC Data Portal token will not function for downloading data from the Pre-release Data Portal environment using the Data Transfer Tool or API. However, the Pre-Release Data Portal token will function for downloading data from the GDC Data Portal using the API or Data Transfer Tool. Finally, if a new token is generated in the Pre-release Data Portal this will invalidate the token downloaded from the GDC Data Portal and vice versa. As with the GDC Data Portal, downloads of large or numerous files is best performed using the GDC Data Transfer Tool. Information on the GDC Data Transfer Tool is available in the GDC Data Transfer Tool User's Guide. An important distinction for use with the Pre-Release Data Portal is that it must always be used with a token and with the option -s https://api.awg.gdc.cancer.gov. The GDC Pre-Release Data Admin Portal allows admins to create and maintain Pre-Release Data Groups and associated projects, as well as grant appropriate access to users within these groups. To gain access to the Pre-Release Data Admin Portal please contact the GDC Helpdesk (support@nci-gdc.datacommons.io). 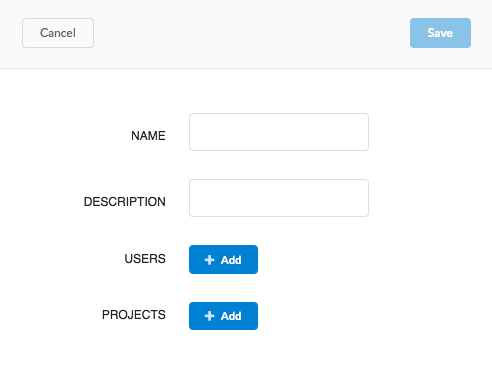 Users: Allows admin to create, view, edit Pre-Release Data Portal user profiles. Groups: Allows admin to manage groups projects / users. User An individual with an eRA Commons account. Project A collection of files and observations that are contained in the GDC database and have been registered in dbGaP as a project. Only certain projects are designated as Pre-Release Data projects. Group A collection of users and projects. 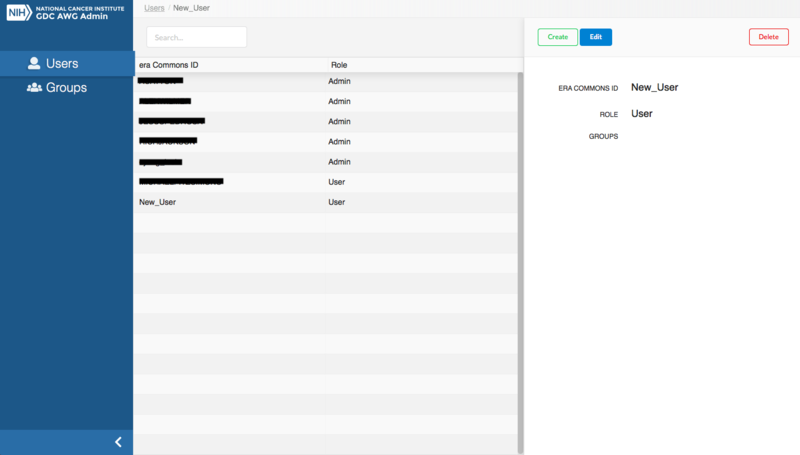 When a user is assigned to a group, they will have access to the projects in that group when they login to the Pre-Release Data portal as long as they have downloader access to the project in dbGaP. The Users section of the GDC Pre-Release Data Admin portal allows admins to manage and create Pre-Release Data users. To create a new user in the Pre-Release Data Admin Portal, click on the Create button on the far-right panel. 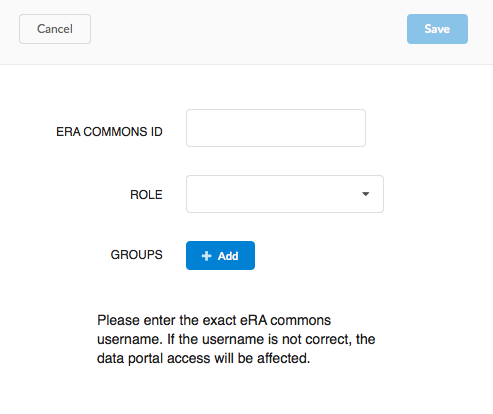 eRA Commons ID: The eRA Commons ID of the user to be added. Role: Choose between Admin or User roles. Group (Optional): Choose existing groups to add the user to. After clicking Save, the user should appear in the list of users in the center panel. 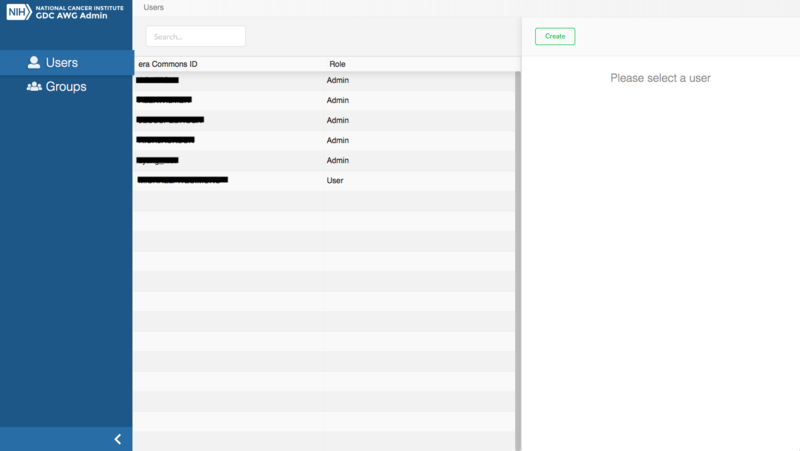 Also clicking on the user in the list will display information about that user and gives the options to Edit the user profile, or Delete the user. 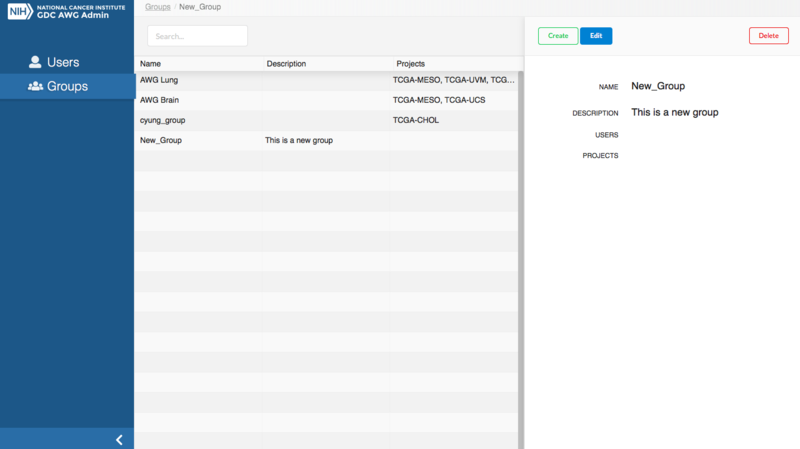 The Groups section of the GDC Pre-Release Data Admin portal allows admins to manage and create groups for which users and projects may be added. To create a new group in the Pre-Release Data Admin Portal, click on the Create button on the far-right panel. Users (Optional): Choose existing users to add to the group. Projects(Optional): Choose existing projects to add to the group. After clicking Save, the group should appear in the list of groups in the center panel. Also clicking on the group in the list will display information about that group and gives the options to Edit or Delete the group. An authorization token must always be passed with every query rather than just for downloading controlled access data.